The NEM team would like to thank Aenima (Telegram: @Aenima86) for making this project and blog. While completely functional, we are releasing this product as an Alpha proof-of-concept. Please use after auditing the processes and code. We also recommend downloading this program and running it locally. Create new KRS: the creation of new private keys, which can be recovered if lost. Encrypt existing KRS: recovery service for existing private keys. Multisig KRS: a user wants to use a third-party service (e.g., a wallet), but wants to make sure he can access his funds if the service shuts down, he forgets his password, or he loses faith in the service. The create new KRS idea comprises that the user uses the KRS service to generate a private key. The key is generated based on a random seed + personally identifiable information. Furthermore, a unique webhook is generated – this can be stored without high security (e.g., in email or notes) because the webhook can only be activated to restore the keys in combination with the personally identifiable information (which should only be known to the user). The user can choose which personal and secret information he wishes to use, for example, this could be information about the title of his favorite book in combination with his passport number and his credit card number; this is information which is only known to the user creating the keys. The KRS service is all browser based, which is important for security because no information is leaving the user’s own computer. Subsequently, the user’s new private key is calculated and can be imported into the user’s wallet. Furthermore, a unique link is created which the user can store in a non-secure manner, and can be activated for a key recovery. Additionally, an existing private key can also be linked to the key recovery service. The private key is encrypted using strong encryption methods and a random seed in combination with personally identifiable information. Like the create new option, a unique webhook is generated, and this can be saved and later used for restoring the original key using the personal information. A major problem wallet users encounter is the security of the keys. While most new secure wallets (in the crypto world) implement multi-signature, in which 1 or 2 keys are created and stored by the user, a problem arises when the user forgets one of the passwords as they would then lose access to the wallet and its contents. The idea with a 2-3 multi-signature wallet where the user controls 2/3 keys and the service 1/3 is important because the user is in control and his fund cannot be compromised in case the service is shut down, get hacked, etc. The multi signature KRS tries to deal with creating 2-of-3 multisig accounts and the problem of recovering lost keys. The idea pretty simple in theory. The user provides a private key with enough funds for a multisig conversion fee. 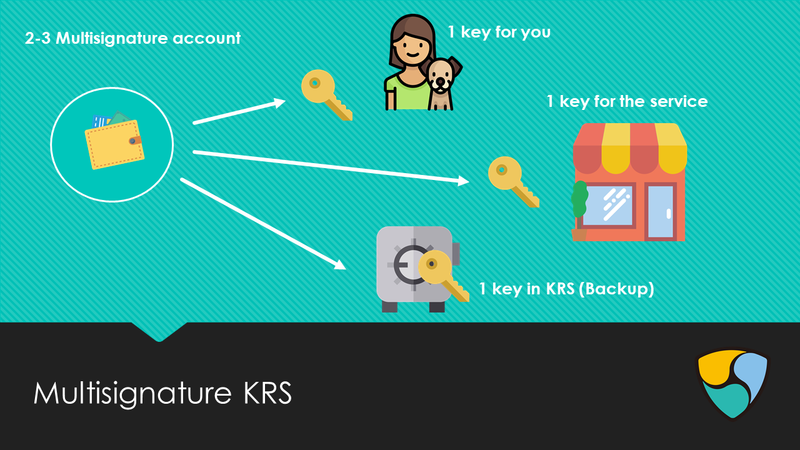 Then the KRS creates the 2-of-3 multi signature account where one key can be stored by the user, one key can be stored by the service and one key by the KRS. 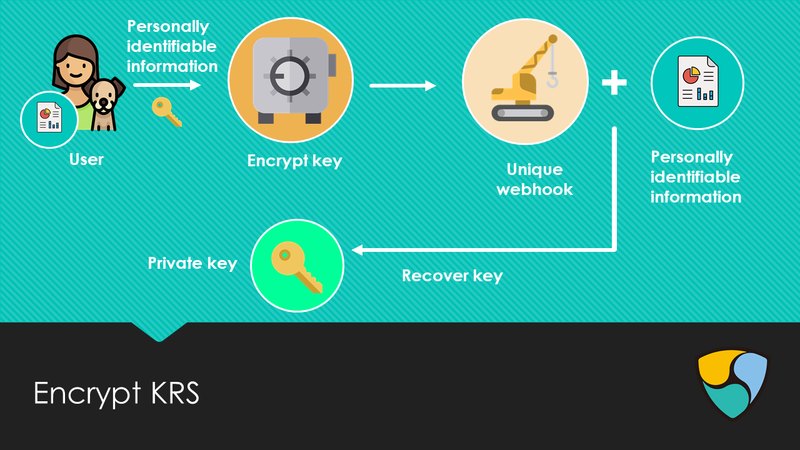 This is not entirely true, because the KRS doesn’t store any keys, but the user is provided with a unique link which can be activated along with the personally identifiable information for recovering the last key. 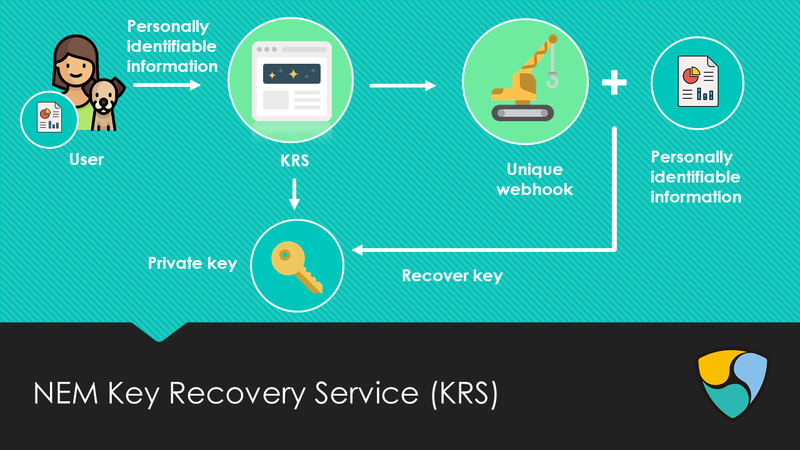 The KRS is open source which means that anyone could run the service and the user could in principle use any of these providers to recover his keys. 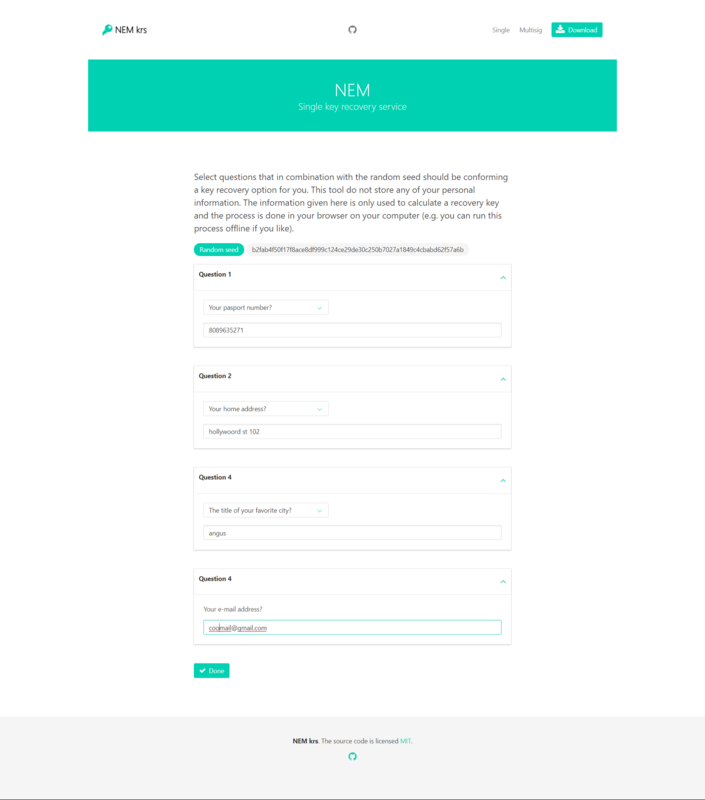 The KRS uses the NEM-sdk for core functionality. One important aspect when dealing with crypto-keys is that they are created with the proper randomness in order to be safe. The random seed is created using the random bytes function when the website is loaded. To calculate the recovery private key, the random seed is combined with the personal identifiable information provided by the user. Besides the private key, a webhook containing the random seed and the question selected by the user is constructed. By activating the webhook the user can reconstruct the answers and the KRS can in combination with the random seed recover the private key. This method is smart because the user does not have to trust a KRS service for storing his private keys. The last key is created in the same manner described for the single key KRS. This key is hidden from the user but can be recovered using the webhook with the random seed and the questions. The three new keys are activated by sending a 1 XEM + fee from the multisignature account to each of the new keys and back again. Now that we have the private keys and corresponding public keys for the three keypairs (+ the private key provided by the user) needed to convert the multisignature account, we do this by broadcasting a multisig transaction to the network. After the transaction is signed and is accepted by the network by including it into a block, then John's account is now a 2-of-3 multisig account. From this point on, only the cosignatories can initiate a transaction for the John's account. Also, any transaction from John's account must be a multisig transaction. We recommend you create a new testnet account and use the test net faucet to get some xem to test this KRS. We also remind users that this product is in Alpha proof-of-concept stage and while no known flaws exist in the creation of keys, it is recommended to be used only after auditing the code and processes yourself.